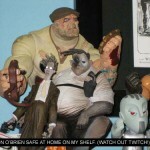 You are currently browsing the Collector Model blog archives for May, 2009. I used to absolutely dread going to Louisville. I’ve been dragged to a rather reprehensible show down there for 13 years. Spending late nights out and early mornings preparing to walk the show for four days straight. Oh, the monotony, the torture, the life draining experience that made up the National RV industry show. Oh, the humanity! That’s what Louisville meant to me, days on end looking at RVs, eating expensive food and going to strip clubs(and if you haven’t been there, they aren’t all they are cracked up to be) until all hours of the morning. I knew the convention center and how to get to the restaurants downtown and to a small German restaurant out in the boondocks. Everything changed last year with my first trip to Wonderfest and this year was even better. We started planning in earnest for the show a couple weeks ago. We had Jim Small working on buildups for us and JT Graphics doing protoype decals for us for The UFO Mystery Ship and Vulcan Shuttle. Those cut a little close to the wire but they all arrived in time. We were still packing up our booth and buildups the morning before we left. We headed out about an hour late to make it in time to start set up at 5:00 Friday. We got there and met up with a friend of the company who helped as much as he was allowed to carry our stuff into the show. We had set up a dinner appointment with him and our 1/350 TOS Enterprise consultant, Gary Kerr and found ourselves running out of time. We managed to get the booth set up in time to start a late dinner. Dinner was fun talking to Gary and our other guest about TV shows like Star Trek and Lost In Space among others. It was a great chance to get to know each other better. I’m really looking forward to having Gary’s input on the kit. Bedtime came quickly after the meal. We got up the next morning in time for breakfast before getting into the show to set up our buildups. Again, we had to rush to get it all set up. Early birds got the brush off as we finished setting up around 9:00. 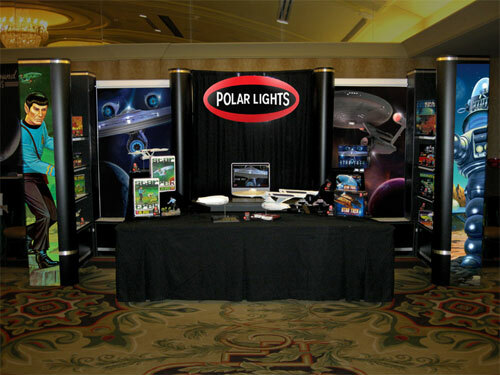 We brought along a computer to show off the website as well as some striking new graphics for our booth. A candy bowl and our survey were put out for all to consume. 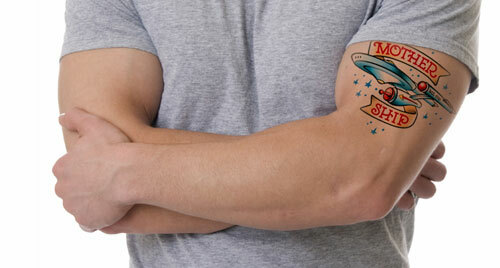 As a reward for filling out a survey, folks received back two Star Trek tattoos and an entry into a drawing. (Third prize, a Witch kit, went to Tyler Robbins, Scott Scariot claimed a Robby kit as second prize and Beth Waddell took first prize, a spiffy new 1/350 Enterprise 1701A kit. Congratulations, prizes will ship shortly) We had a great response to the survey with twice as many filled out as last year. We are still tabulating the data that will help guide some of our possible kit choices and put some things into perspective for us. 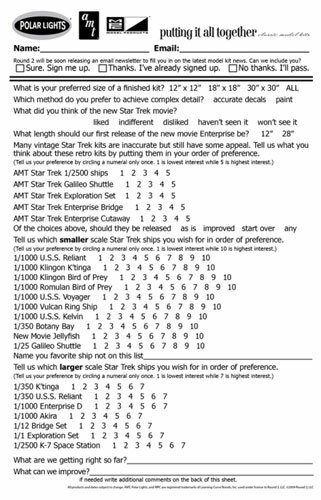 In looking over the surveys, the most shocking thing I found was that it looks like a substantial majority actually likes the new Star trek movie. That’s a good thing because besides showing off new model kits we announced our agreement to produce kits based on the new film. More details on that to come soon! We had plenty of traffic both days and it seemed like most of the vendors did well at the show. Among other high points was meeting John Eaves when he stopped by the booth. I tried to visit him later in the show but couldn’t seem to catch him. Luckily, he stopped back by so I could give him an Enterprise E kit. Bob made a point of telling him that I had done the cover painting. (I’m kinda shy in person) I made a comment about how I hadn’t realized how complicated the ship was until I had to draw it. John smiled and didn’t tell me it sucked so I took that as a compliment (he was extremely friendly). Saturday went by pretty quickly. I made one of my only purchases early that day when I saw a huge mobster figure hanging at a dealer right at the entrance. 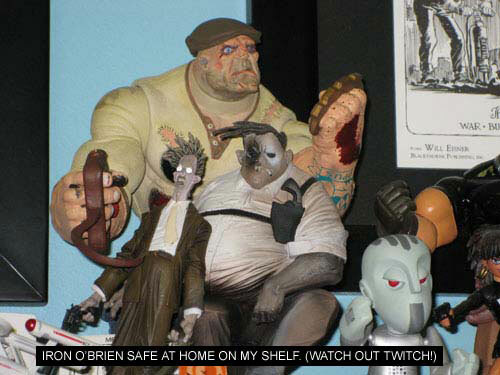 I had never seen them before but he’s a huge Mezco figure that looks quite like the Goon. I was shocked to learn he was only $5 so I had to stake my claim before someone else grabbed him up. My other private purchase was a FineMolds Tie Fighter. I’d never seen a FineMolds kit first hand before and the Tie Fighter is one of my favorite space ships. I hope they come out with a larger scale version some day. I also picked up some “R&D” kits of the MAK A.F.S. Mk2 figure and the new, popular Falke vehicle. I’m starting to dig into other kits like this to “see what they are made of”. I saw a few excellent builds of the Falke in the contest showroom. The talent demonstrated in that room always blows me away. Amazing, amazing work. I particularly like well-done figural stuff and this is the show to find it. 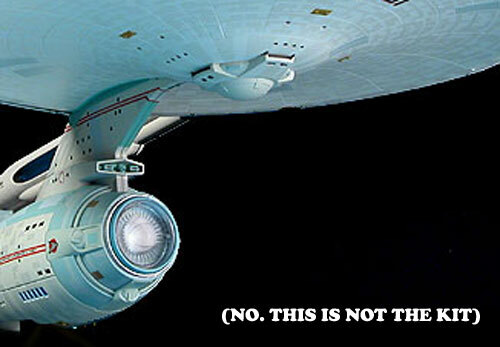 But hey, we make space ships here and folks out there are doing some awesome work with our kits. There were too many to mention but to me the best use of one of our kits was by the gentleman who did a great job with our 1/350 refit, painting it with real pearl paint and adding lights. It was impeccable. Not to be confused with what we referred to as the U.S.S. Vegasprise. This was a 4’ long refit that was actually shaped pretty nicely if you could stand it long enough to look at it. It literally had bells and whistles on it, and lights and chrome and everything that a well-made jukebox would have. It turns out there is more to Louisville than a convention center. They’ve got movie theaters there too. One in particular looks like it has a great program going on showing great movies form my formative years. This particular weekend, they were showing Alien and the show organizers made sure that we Wonderfest-ers would have the opportunity to see it. It would have been great but as it turned out I was so incredibly tired from preparing for, driving to and working the show, I couldn’t keep my eyes open through the parts I really wanted to see. I barely got glimpses of the space jockey on the big screen. It was a real shame. I’ll need to see if we can get an arrangement like that made with a theatre around here. It seems like a great program. Upcoming films were Sixteen Candles, Superman 2 and Master of the Universe… Not so sure about that one. I made a brief stop at the CultTVMan suite to round out my night. I bounced a couple kit ideas off Steve and checked out the Doctor Who Easter special. I’d always heard of the show and it seems like the current series is pretty popular. I have to admit to never watching a single episode. The show was entertaining and I can see the appeal. The not so special effects still distract me though. I’m not sure how everyone can put up with them. I guess if you like the character and story enough you can forgive the budget a little. Sunday seemed like a decent crowd and it kept us busy enough. Things got a little slow towards the end of the day. That’s when I got my last look around the show and made some of my purchases. We wound up the day by tearing down the booth and were the second to the last people still in the room. We were a little late to the Wonderfest banquet. It was worth attending but the food was a little blah and the program was a little longer than it maybe should have been. I know lot’s of other folks enjoyed it all but it had been a long weekend. I’m already looking forward to next year. Maybe I’ll find time to do a buildup worthy of entering into the contest or maybe participate in the Iron Modeler competition. Just like last year, we learned a few lessons and now we know better how to prepare for the next show. What is your favorite model kit of all time and why? Be honest. I don’t want every response to be one of our kits. It doesn’t even need to be sci-fi. I truly want to know what commercial kits are great and what makes them so. Ease of build? Amount of detail? Parts fit? I want to learn from these kits in an effort to make all of ours just as great. I’m all ears. You know those extras on DVDs, where you can view scenes that were ultimately cut from the final edit of a film? Sometimes those provide a fascinating glimpse into what might have been. Occasionally, those scenes add another level of character or plot detail that heightens one’s appreciation for the work. 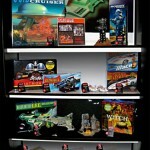 What does that have to do with model kits? Well, sometimes product development is like that: many things might be developed that end up never being part of the final product, in some cases, entire product lines might make it through concept and mockup stage and never see the light of day. We hope to occasionally be able to highlight such lost treasures (or discarded trash, depending on your point of view), whether it’s concept work, product or packaging, both here and on our sister blog, foreverfunblog.com. 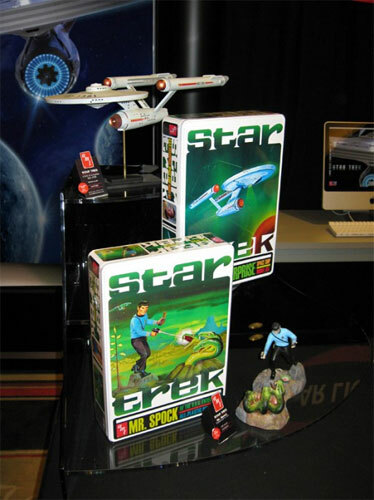 The cool thing about this packaging is that it really shows off the kit nicely – those are shots of the actual buildup, enhanced with some Photoshop window lighting and phaser effects. As usual, Jim Small did a fantastic job putting together and finishing this kit, and provided the photography of the buildup as well. Jim has a great understanding of how to “pose” and light a kit for dramatic effect – I had to do very little digital tweaking to the ship itself. 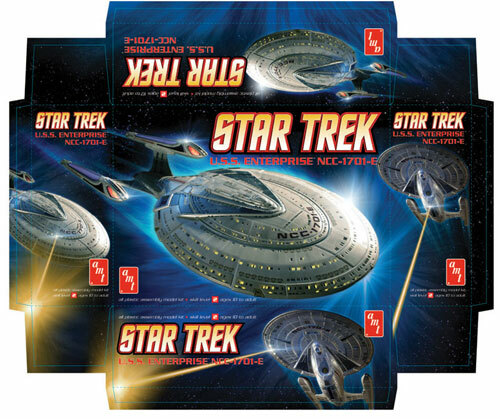 The flares and glows added to areas of the ship and the background are a part of our Star Trek packaging graphic vocabulary, and helps to provide a cohesive look to all our Trek packaging. If you aren’t there already, you’d better leave now… well depending on where you live. By the time this hits the blogosphere we should have our truck packed with all of our buildups from the Enterprise 1701A to the Witch to… hmmm, what else could we be planning? 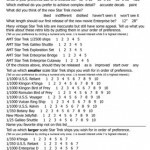 1/1000 scale Enterprise Refit- We’ll have a package mockup. Sorry to be so anti-climactic. 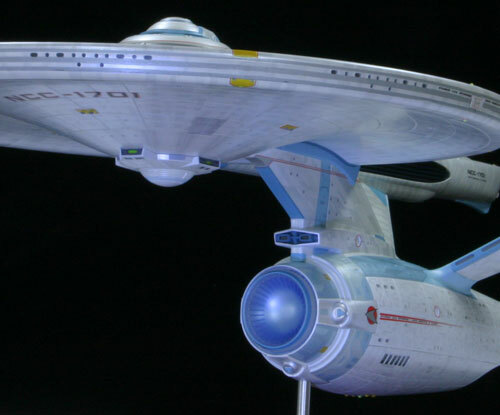 If you can imagine our big 1/350 Enterprise A kit but a lot smaller like our 1/1000 TOS Enterprise and with a few little corrections here or there… well, you get it. I’m sure we’ll get lots of interest in this kit. We’ll be happy to discuss it with you. We definitely won’t have a test shot or even a mockup but just knowing its on the way is exciting. 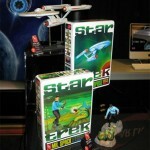 Star Trek Model Kits: Boldly Going… Again! How cool is it that Star Trek is part of the general public’s consciousness again? Paramount has done a stellar job of marketing the new Trek flick, and that’s bound to have a positive effect on all Trek-related merchandise, classic Trek or “new” Trek. 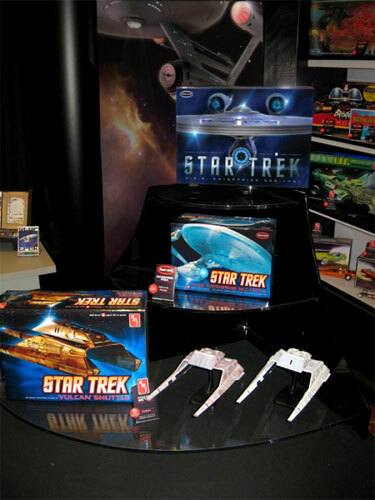 Interest in our Star Trek kits seems to be pretty high, and the positive buzz surrounding the new film should help further interest. Wonderfest ’09… model kits in hand. See you there. Vulcan Shuttle- This is another great collaboration piece with lot’s of spiffy goodness by Jim Small and JT Graphics. Jim has created two great buildups and done all of the groundwork of creating the decals of the Motion Picture version of the ship. JT did a great job turning out the prototype decals for us. 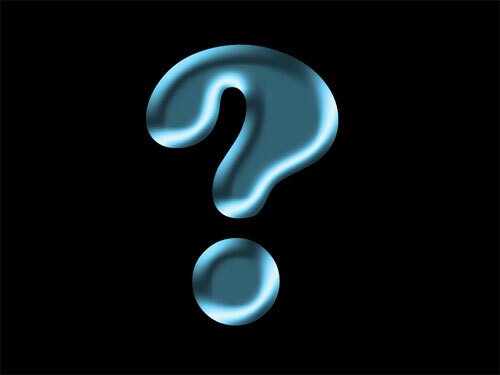 In addition to the TMP version, we’ll be showing a preliminary concept of a Federation version. The Motion Picture version will show a few of the details we will be adjusting to make the ship more accurate to the filming model. 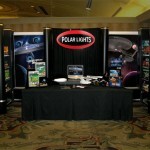 Come to the show to find out a few more cool tidbits about the kit. 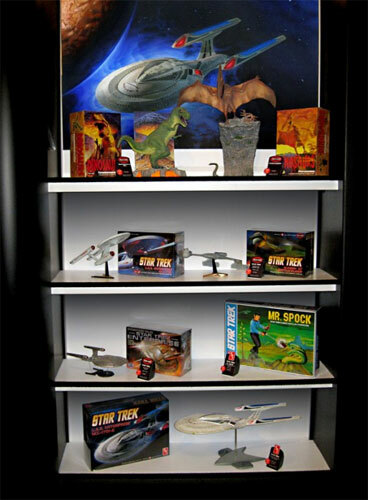 In addition to the Vulcan Shuttles, we’ll have our buildup of the classic AMT Spock vs the three-headed snake kit. It’s a great little kit that builds well and has the perfect amount of detail and retro kooky-ness. 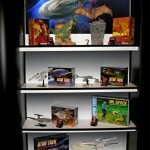 With this kit, Spock will live long and prosper… not so sure about the snakes though. Continuing with the model kits… well, if you’ve been following along thus far, you get the idea. 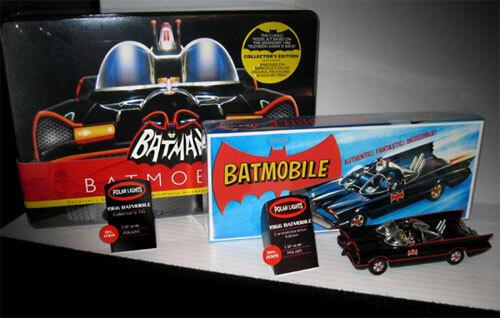 1/32 scale ’66 TV Show Batmobile – We’re thrilled to bring this classic kit back. 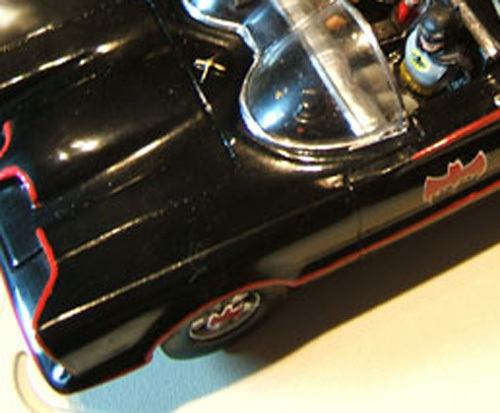 The ’66 Batmobile is my favorite vehicle of all time. I can’t wait to build one of my own. With this release, everyone that wants this classic kit should be able to afford it. We’ll have a buildup on hand and a preview look at the packaging. The build will be a vintage kit but the mockup I’ve seen looks like it will be a perfect match to the rare Aurora kit. 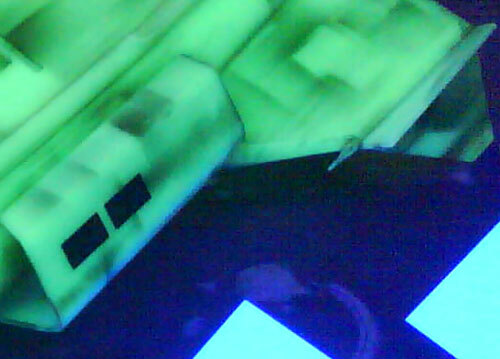 UFO Mystery ship – We’ll have a great buildup done by our pro-builder Jim Small. It’s got tons of great weathering and decals by JT Graphics. This a cool ship design. As I assembled my test shot of it, I fell in love with each additional part. The look of the build will relate to the new story that will come on the instruction sheet like the classic Leif Ericson, did. We’ll have a mockup of the package as well. Sorry, you’ll have to make up your own sounds of space for this release though. 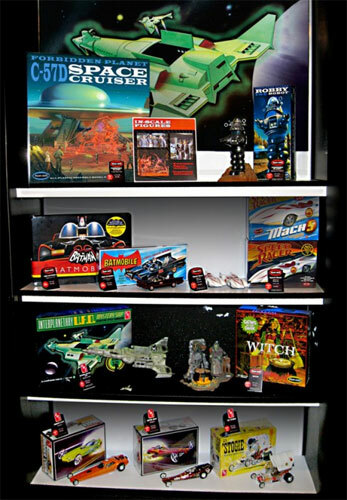 Again, returning to a preview of our display for Wonderfest ’09 model kits. 1/350 Enterprise 1701A- We’ll have our iHobby buildup with prototype decals on it. 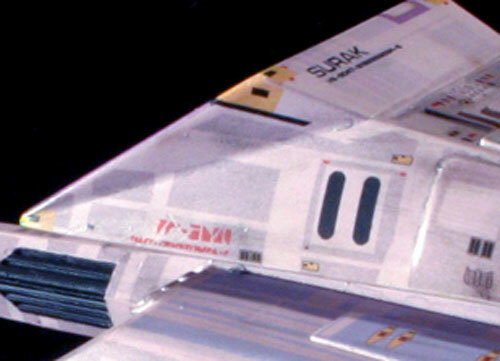 Hopefully, we will also have at least a section of the ship built up using the production decals. We’ll also have a sample copy of the kit open so everyone can get a good look at the changes to the kit, the new decals and the accompanying instruction sheets. Everyone that’s been curious to see the decals and revised base, this is your chance to check it out. The kit will be available very soon. I think the first shipment will arrive in our warehouse this week! 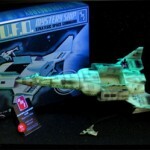 Starting in earnest, a preview of the cool sci-fi model kits we’ll be showing at our Wonderfest booth. Robby the Robot- He’s a cool classic of sci-fi. With this release, we have included a new base that better reflects the distinctive detail of Altair 4. Come take a look and see the cool build Jim Small did for us. You can see first hand how he used magnets to make the figure poseable and easy to plug in alternate parts. 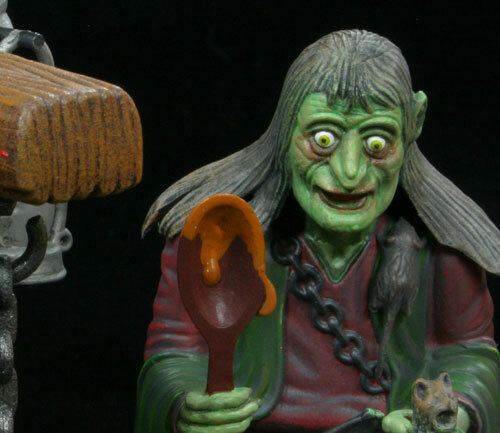 The Witch- Man, isn’t she a BEAUTY!?! Well, at least the buildup is. 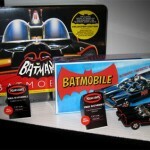 Be sure to take a look and see all of the detailed parts included in the kit. Also, make sure to check out our open box of the kit and check out the optional glow in the dark parts including glow in the dark CLEAR parts. 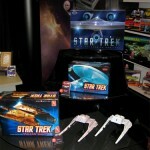 Enterprise 1701E – If you haven’t landed one of these kits yet, come see what you are missing. We’ll have a buildup featuring the new base. We’ll also have a sample of the new decal sheet to show the additions we’ve made.